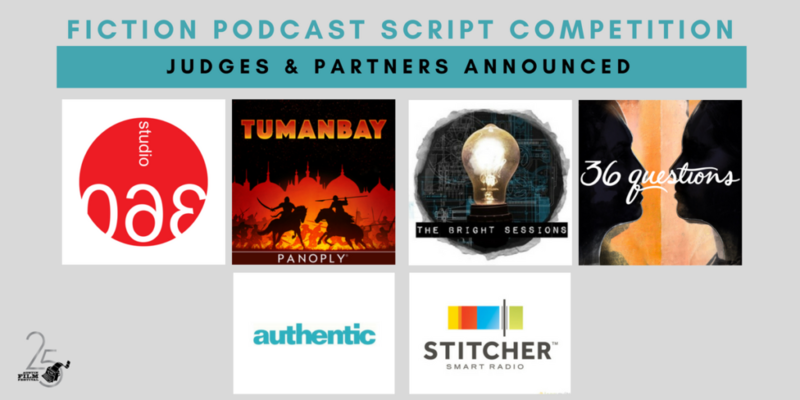 Executives at podcast industry leaders Stitcher, Authentic, PRI & STUDIO 360, and the creative minds behind THE BRIGHT SESSIONS and TUMANBAY to judge the script competition! AUSTIN, Texas—June 21 2018—In order to further expand their legacy of supporting storytellers, Austin Film Festival, (AFF) is pleased to announce a distinguished panel of judges for its returning Fiction Podcast Script Competition, which includes development heads and creators of successful fiction podcasts such as THE BRIGHT SESSIONS and TUMANBAY. They look forward to connecting audiences with incredible new stories, as well as continuing to connect writers with our incredible judges through a medium that offers unprecedented access to audiences and limitless opportunities to launch new stories. Authentic and Stitcher have officially signed on as sponsors of the competition which is open to scripts for any ongoing series intended for a purely acoustic medium. The final deadline to submit to the Competition is July 6. For more information about the Fiction Podcast Script Competition, click here. Shippen & Street will also be featured in an exciting slate of audio fiction programming that will take place during the Austin Film Festival’s Writers Conference, October 25 – 28. Along with representatives from Audible, and the writers/creators of the hit podcast, 36 QUESTIONS, Ellen Winter & Chris Littler, plus more to be announced soon! Programming will discuss the art of storytelling within an acoustic medium, as well as the address the nuts and bolts of creating a successful fiction podcast. Austin Film Festival (AFF) is a non-profit organization dedicated to furthering the art, craft, and business of writers and filmmakers and recognizing their contributions to film, television and new media. AFF champions the work of aspiring and established writers and filmmakers by providing unique cultural events and services, enhancing public awareness and participation, and encouraging dynamic and long-lasting community partnerships. This project is supported in part by the Cultural Arts Division of the City of Austin Economic Development Department and the Texas Commission on the Arts. All attendees and events are based on permitting schedules and are subject to change and/or cancellation without notice. Badges and passes are available for purchase online at www.austinfilmfestival.com or by phone at 1-800-310-FEST. To apply for press credentials, please complete this form. About Authentic: SERIAL, THIS AMERICAN LIFE, S-TOWN and over 300 other top podcasts partner with Authentic for monetization of their podcasts. About Studio 360: The Peabody Award-winning “Studio 360 with Kurt Andersen,” from PRI in association with Slate Magazine, is public radio’s smart and surprising guide to what’s happening in pop culture and the arts. Each week, Kurt introduces you to the people who are creating and shaping our culture. PRI is a global non-profit media company focused on the intersection of journalism, storytelling and engagement to affect positive change in people’s lives. We are creating a more informed, empathetic and connected global community by inspiring people to understand the world’s cultures, issues and events. Each day, we share powerful stories, encourage exploration and create connection by combining content and engagement opportunities to affect change.